This year, the vernal equinox falls on Wednesday, March 20. At exactly 21:58 UTC, the sun will be exactly above the Earth’s equator. The word vernal comes from the Latin word vernalis, meaning “of the spring.” And equinox comes from the Latin words aequus, meaning equal, and nox, meaning night. The day has 12 hours of daylight and 12 hours of night time. In the Northern Hemisphere, the day marks the beginning of spring. On this day, people living in colder areas of the Northern Hemisphere hope they can put away their winter clothes. They also may soon start planting flowers and vegetables in a garden. Here in Washington, D.C., Wednesday also marks the first day of the National Cherry Blossom Festival. Each year, people from around the world come to see the beautiful pink and white blossoms on the thousands of flowering cherry trees. For Washingtonians, the cherry blossoms are a welcome sign that spring has arrived. The Mayan Pyramid at Chichen Itza, Mexico. Today, cultures around the world have their own ways of identifying and celebrating the arrival of spring. FILE - Women wearing Kimonos pose for a souvenir photo with blooming cherry blossoms in Kyoto, Japan. In Japan, spring is marked with a huge cherry blossom festival, known as hanami. The tradition dates back more than a thousand years. People gather under the blooming trees to eat, drink tea, celebrate and enjoy the cherry blossoms, known as sakura in Japanese. Artists and poets celebrate the short-lived blooms as a symbol of beauty. Iranian youths, wearing red clothes and black makeup as a symbol of the Iranian New Year, sing and play tambourine at Tajrish square in northern Tehran, Iran, ahead of the Iranian New Year, or Nowruz, meaning "new day," March 18, 2017. For many countries in Central Asia and the Middle East, the beginning of spring also marks the beginning of a new year. The celebration is called Nowruz. The words "now" and "ruz" means “new day” in Farsi. Countries along the ancient Silk Road trading path, including Afghanistan, Iran, Turkey, Uzbekistan, and other Central Asian nations, celebrate Nowruz. In the past, Iran was the only country where Nowruz was an official holiday. But after countries gained their independence following the fall of the Soviet Union, many made Nowruz a national holiday, as well. During Nowruz, people visit family members and friends and exchange gifts. Iranian families set up a “haft seen” display of seven special items that represent spring and new beginnings. Ethnic Uyghurs compete in horse racing at a Nowruz event outside the city of Kuqa, in China's Xinjiang Uyghur Autonomous Region, March 21, 2011. ​In Uzbekistan and other places in Central Asia, people watch wrestling events, horse races and a special horseback game called, in Uzbek, Kopkari. In this game, two teams of players on horseback try to get the body of a headless goat into a goal. 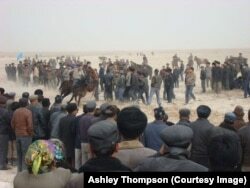 A similar game is called buzkashi in Afghanistan and oghlak tartish in Kyrgyzstan and Uyghur-speaking areas. Indian students play with coloured powders to celebrate Holi festival in Kolkata on March 1, 2018. 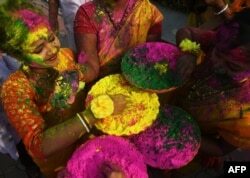 Many in India and Nepal mark the arrival of spring with the Holi festival, known also as the festival of colors or festival of love. People celebrate the festival by covering each other in -- you guessed it -- colors! Children especially enjoy the festival, as they get to throw colored powder and water-filled balloons at others. Some say the festival comes from a story of the burning of the devil Holika. It represents the victory of good over evil, or the arrival of spring after a long, dark winter. Others say the celebration was inspired by the story of two young lovers with different skin colors. Krishna, who has blue skin, was in love with Radha. So, he colored Radha with paint leading to the modern-day colorful festival of love. 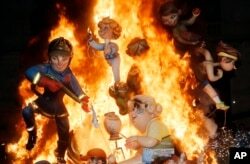 People in Valencia, Spain, have their spring celebration called Las Fallas. It is a wild, five-day street festival involving fire. The festival centers on the creation – and burning – of huge colorful statues made of wood, paper and plastic. The statues are meant to look like real people. Often, they are modeled after Spanish politicians or stars. Valencian communities and organizations work all year to create their structures. As many as 700 of them are then placed throughout the city, with fireworks inside. Las Fallas begins March 15, with events like bullfights, parades, and cooking and beauty competitions. Then, at midnight on March 20, the city turns off all its streetlights and the statues are set on fire. This marks the end of the festival, and the beginning of spring. I'm Ashley Thompson. And I'm Caty Weaver. What do people do to mark the beginning of spring where you live? Let us know! Write to us in the Comments Section or on our Facebook page.